How the demo works: Come to the Slach Party 4 In France !!! see: http://slach.fr.st for more details. don't hesitate to mail us also. Like each year a new intro invitation to that real scene party. All elite french & south european scene will be there. 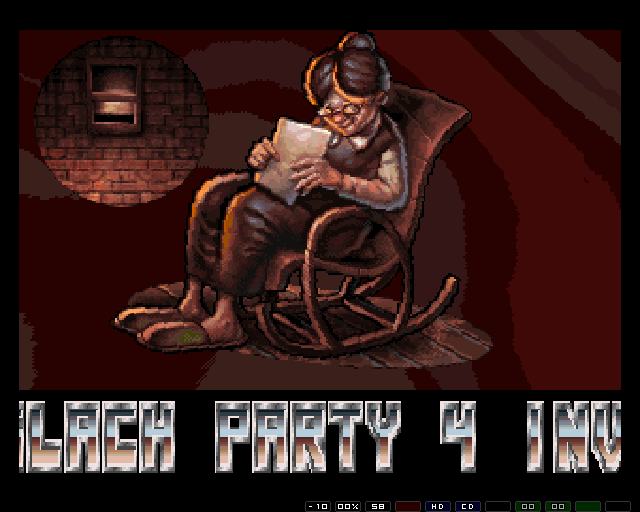 Amiga & PC demo contest are ->2<- contests. also 64Kb intro contests. No gamerz ! Alcool and booze allowed. Great organisation ! the room is specially organized for fun !! a special crash-compo team will come with a full truck of machines to destroy. 8bit computer museum with more than 50 rares specimens. See demonstrations of it and H24 demos on the big screen. food, all that, that's OK.... Let you go at the SLACH. Thinks that it's summer and the ocean is not so far from the place !! free for girlz and foreigners.